The Volvo-Penta D4 300 hp engine provides a range from economical 8 kts cruise to 18 kts performance cruising. Full color electronic engine control display Single lever throttle and gear electronic control at both helms. Trim tabs, bow and stern thrusters, flybridge helm with full controls. 4- 8D 12 volt batteries AGM lead acid providing 440 amp hours. Plus 1 for engine start, and 1 for bow and stern thrusters. Onan 5kw generator the hours are unknown but has had very little use. Kisae Aboso 2000 compact inverter charger. There are five 110 electrical GFI outlets and two 12 volt outlets. Cabin heat and air conditioning is by Marine Air. Heat is also provided by a Red Dot type of heater supplied from the engine while operating. Total LOA with swim step 35' 2"
Quoted displacement is dry weight provided by the builder. Typical trailerable weight is about 14,000 for the boat with gear aboard and one half fuel. The trailer weight is about 2,200 lb. The bottom is vinylester resin barrier coated. 11 gallon hot water heater heated by shore power, engine and generator. Helm station door for side deck access. Comfortable steps lead from the port side cockpit the flybridge with a full upper helm, the mast for radar and other electronics and the solar panel. The helm and mast are hinged to facilitate lowering for trailer hauling. Waterline Boats did not independently verify capacities and measures, which are reported from seller-provided information and/or literature. Upon walking up to this Ranger one is struck by the attention to detail. The quality fiberglass, polished stainless steel, attractive color combinations and all of the clean Sumbrealla protective canvas. Boarding is via the swim step and the transom door. The cockpit features three areas of seating, and outside sink and cabinet and the port side stairs to the flybridge with the upper helm and bench seating. The upper helm has all of the instruments and controls as the lower helm. There is plenty of room for a kayak or two on a rack above the solar panel. The entry to the cabin is a door way on the starboard side. After entry directly to port is the entry to the day head and aft cabin with sleeping for two. To starboard is the very attractive full galley including the propane two burner stove with oven in gleaming polished stainless steel. There are two large galley sinks of highly polished stainless steel. The galley includes a refrigerator with freezer, a wine cooler and a microwave oven. Forward to port is a large dining table with seating for five. It also will convert for sleeping for two. Forward to starboard is the helm with a door to the deck. The helm seat folds forward to extend the galley counter. To port is forward facing seating. Forward and down a step is the forward cabin with a double berth with a flat screen television mounted on the aft bulkhead. To port is the master head with shower and beautiful glass wash basin and the electric toilet. This Luxury Edition Ranger will bring many hours of pleasurable exploring and cruising the extensive waters of the Pacific Northwest. It could be stored on a trailer during the off season or be trailered to a different cruising location. Stainless steel safety railings all around the deck, cockpit and flybridge. Canvas coverings for the windows, cockpit seating, flybridge helm and seating. Well-protected cockpit provided by full canvas overhead. 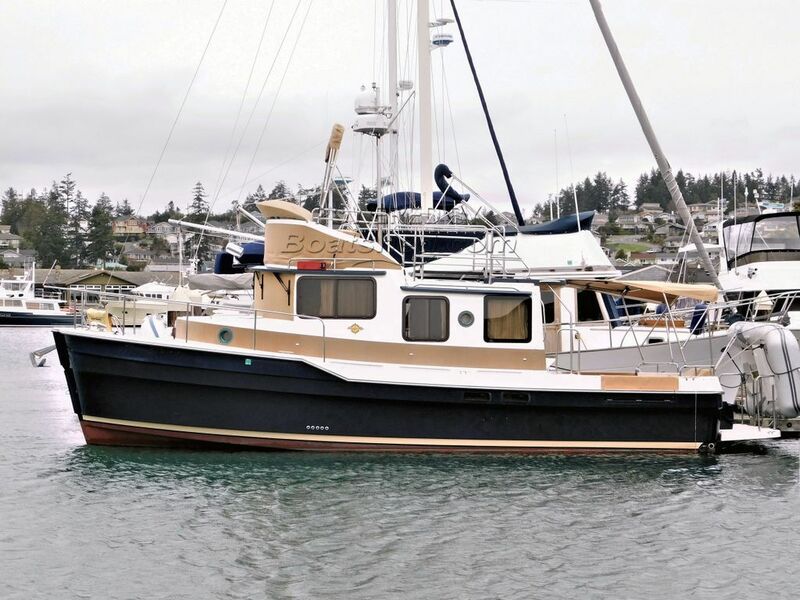 Here is an opportunity to own a very popular NW-style performance trawler. Though a 2015 model it was purchased new in 2016 and is a single-owner offering. "This Luxury Edition includes the Generator and a heat pump/air conditioner and the current list price (new) is $345,000." "The most significant change that I'm aware of is the new model has a hardtop over the cockpit. Ours has a small hardtop over the main cabin entry door. Otherwise it has a Sunbrella bimini which covers the cockpit completely and snaps to the hardtop." "The Volvo D4 is 300hp and gives us a max cruising speed of 16-17 knots. We normally keep it at 7-8 however. The floorplan is exactly the same as the new boat. The forward berth and a double bed with a combination head/shower. There is a step down to a double sleeping compartment near the aft entry. Immediately aft of this sleeping area is a day head which is private when the door between the sleeping compartment and the main cabin is closed." "All systems on the boat work properly and the boat is basically in "as new" condition. It has just over 200 hours on it. I bought the boat in July or August of 2016, so the 3 year warranty on the engine and the generator are in effect until next summer. I'm the original owner and have all the records. The bottom paint was done in late 2016. " This Ranger Tugs R-31CB Trailerable Fast Trawler has been personally photographed and viewed by David Carleson CPYB of Boatshed Seattle. Click here for contact details.